Why Do You Need To Audit Bill Of Material And How? When the accounting department issues financial statements, one of the largest expenses listed on it is the material cost (at least in a manufacturing environment). Unless they conduct a monthly physical inventory count, the accounting staff must rely on the word of the logistics department in assuming that the month end inventory listed on the books is the correct amount. If it is not, the financial statements can be off by a significant amount. The core document used by the logistics department that drives the accuracy of the inventory is the “Bill Of Material (BOM)”. This is a listing of the components that go into a product. If it is incorrect, the parts assumed to be in a product will be incorrect, which means that product costs will be wrong, too. This problem has the greatest impact in a back flushing environment, where the bills of material determine how many materials are used to produce a product. Thus, the accuracy of the bills of material has a major impact on the accuracy of the financial statements. The solution is to follow an ongoing program of auditing bills of material. By doing so, errors are flushed out of the bills, resulting in better inventory quantity data, which in turn results in more accurate financial statements. The best way to implement bill audits is to tie them to the production schedule, so that any products scheduled to be manufactured in the near future are reviewed the most frequently. This focuses attention on those bills with the highest usage, though it is still necessary to review the bills of less frequently used products from time to time. The review can be conducted by the engineering staff, the production scheduler, the warehouse staff, and the production staff. The reason for using so many people is that they all have input into the process. The engineering staff has the best overall knowledge of the product, while the production scheduler is the most aware of production shortages caused by problems with the bills, and the warehouse staff sees components returned to the warehouse that were listed in the bills but not actually used; the production staff must assemble products and knows from practical experience which bills are inaccurate. Thus, a variety of people (preferably all of them) can influence the bill of material review process. 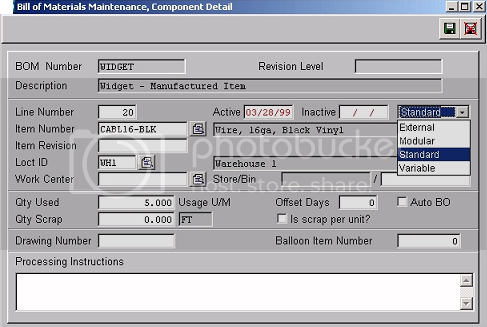 Measuring a bill of material includes several steps. One is to ensure that the correct part quantities are listed. Another is to verify that parts should be included in the product at all. Yet another is that the correct subassemblies roll up into the final product. If any of these items are incorrect, a bill of material should be listed as incorrect in total. For a large bill with many components, this means that it will almost certainly be listed as incorrect when it is first reviewed, with rapid improvement as corrections are made. The target that a company should shoot for when reviewing bills of material is a minimum accuracy level of 99 percent. At this level, any errors will have a minimal impact on accuracy, cost of the inventory, and cost of goods sold. If a controller can effectively work with the engineering, production, and logistics staffs to create a reliable bill of material review system, the result is a much more accurate costing system. Future Value of Inventory is in Doubt, What Should I Do?